Rapper and actor Ice Cube is making a documentary for ESPN about the Raiders football team. Gangsta rap pioneer Ice Cube used to be a pretty intimidating guy, before he started making children's movies about family vacations. But take heart, N.W.A. fans. 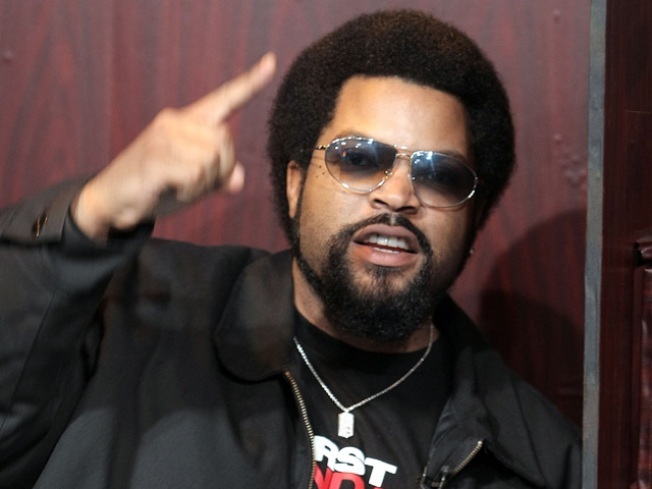 It looks like Ice Cube is going to try to make better movies. In fact, he's working on a documentary film about the Raiders. Ice Cube even made an appearance at Raiders practice Tuesday in Alameda. The San Francisco Chronicle's David White was the first to note Ice Cube's unexpected appearance at Raider practice on his Twitter feed, and faithfully tweeted all of Cube's comings and goings at Raiders HQ. "Ice Cube a superstar out here, even the country boys shaking his hand," White posted to his Twitter page. "JaMarcus w/longest visit." JaMarcus Russell and Ice Cube had a long visit? I'm guessing that "low-calorie foods" did not come up as a topic in that conversation. The Oakland Tribune's Jerry McDonald asked around as to why Ice Cube was attending Oakland Raiders practice, and reports that "(Raiders) CEO Amy Trask said he is working on a few projects with the club." Fortunately for internet gossip hounds like me, Ice Cube's movie-making posse does not have the same knack for obsessive secrecy as the Oakland Raider football organization. Turns out that Ice Cube has been enlisted by ESPN to make a documentary called "Straight Outta L.A.," a film which will document the period during which the Raiders played in Los Angeles. "The Raiders captured a large number of black and Hispanic fans in L.A. at a time when gang warfare, immigration, and the real estate boom were rapidly changing the city," says an ESPN press release about the project. "The L.A. Raiders morphed into a worldwide brand as the team's colors, swagger, and anti-establishment ethos became linked with the hip-hop scene that was permeating South Central Los Angeles." This is just the kind of publicity that the NFL loves! "Still a die-hard Raiders fan," the release continues, "Cube will explore the unlikely marriage between the NFL's rebel franchise and America's glamour city and show how pro football's outlaw team became the toast of La La Land." Exciting that Ice Cube is doing a project about the Raiders, but disappointing that it focuses on the period during which they left Oakland. Fortunately for Oakland Raider fans, we know how this movie ends. Joe Kukura is a freelance writer who tried to incorporate some N.W.A. lyrics into this article, but just couldn't come up with anything printable.